Runtimes for process control (SOFTLOGIC and SCADA/HMI class) correspond to TRACE MODE, whereas the runtimes for manufacturing automation (EAM, HRM, MES class) have the T-FACTORY name. All TRACE MODE and T-FACTORY runtimes are excellently integrated between each other, and lay a unified platform for production management. The TRACE MODE 6 and T-FACTORY 6 runtimes are conventionally subdivided into servers (nodes) and clients (consoles). This subdivision is a somewhat conventional, because a TRACE MODE console in a number of system configurations can perform functions normally attributed to servers (channel database processing, execution of programs etc. ), and servers can perform functions of operator HMI, which is frequently considered to be a client task. Both client and server software is developed in a unified integrated development system and has a unified database of distributed variables, which attributes can be freely addressed by any TRACE MODE and T-FACTORY runtimes. TRACE MODE SCADA/HMI has a built-in redundancy concept, so every system component may be provided with standby node. TRACE MODE 6 development system may be used to build multilevel, hierarchically organized, redundant control and remote control systems. General structure of TRACE MODE 6 based control system (SOFTLOGIC, SCADA/HM levels), is given in a figure below. 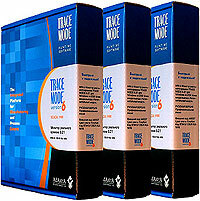 TRACE MODE 6 networking is fully based on TCP/IP protocol. The Real time monitors with different combination of the above given features are available. Moreover, the Real Time Monitors versions with automatic hot redundancy are also available. The TRACE MODE 6 SCADA/HMI RTM server has its own multithreading priority driven real time system. 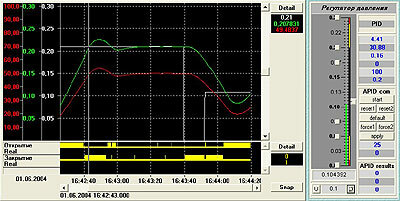 While operation in normal mode, minimal response time of the Real Time Monitor 6 is equal to 0.01 s (10 ms). However, the response time can be reduced by several times when using special FAST channels, which processing is performed in 2 ms cycles. 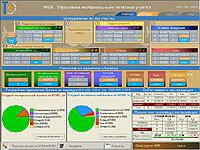 The RTM 6 real time system can be set up flexibly by means of redistribution of time resources for different threads of the computation kernel, or priorities for particular tasks. OPC and DDE exchange, etc. The TRACE MODE SCADA/HMI has a system of automatic network time synchronization, which allows to fix events in a distributed control system to time scale. It is possible to perform ON LINE project editing (edit HMI interface or program logics in real time without stopping the control system). It is also possible to add or remove "pens" in the trends in real time, re-link graphic objects, change line color and stile. TRACE MODE has a powerful alarming system, provided by a built-in alarm servers. The HMI alarms server saves text information about events occurred in the monitored process. Each message may have different statuses. The alarming system may generate and write down to alarm report an alarm message after occurrence of any king of events. TRACE MODE SCADA/HMI RTM with automatic (adaptive) PID-loops self tuning system is called Adaptive RTM. Adaptive RTM is based on original AdAstrA owned technology. The program provides periodical or continuous online tuning of PID loops in automatic or semi-automatic mode. Adaptive RTM is able to set up control loops in noisy environments and to avoid unstable modes. The TRACE MODE SCADA/HMI adaptive PID-loops provide quality self tuning with the test signal of low amplitude (2-4%). Such small test signal fluctuations do not practically affect the control equipment and do not increase deterioration of actuators. Application of TRACE MODE SCADA/HMI adaptive PID-loops self tuning ensures better quality of control at any time for a wide class of stationary and non-stationary processes being automated. Besides, the report generator with the same functionality is built in the Corporate Logger. TRACE MODE Local Documentation server is designed for small control systems and for personal documentation systems. It should be installed on the same PC with TRACE MODE RTM. The server generates reports using the data from the RTM channels and save them on disk in HTML format for further printing (if required). TRACE MODE Global Documentation server is designed to gather data from many RTMs in a distributed control system and to generate reports. This server should be installed on a dedicated PC. This kind of report generators can gather the data from the unlimited number of PCs and controllers and generates user reports, on the unlimited number of document templates and scripts. The reports may be saved to the hard disk in HTML format for further printing. The Corporate TRACE MODE Documentation server has all features of the Global one. Besides, it contains powerful communication spooler, that allow automation of the report distribution. The reports may be printed, e-mailed, sent on mobile phones, published on web sites etc.. This product is recommended for corporate scale control systems, developed with both TRACE MODE and T-FACTORY or with others HMI, DBMS and ERP. it is recommended to use a dedicated SIAD/SQL 6 real time DBMS server - Global logger on a separate PC. The history archive provided by TRACE MODE Global logger is common for the whole control system. All project nodes may save data in this log. The data logging is performed simultaneously into 3 files of the SIAD/SQL 6 real time DBMS. Another log is reserved for system’s needs. Due to the flexible logged parameters setup system, it is possible to save at the highest speed the history of "fast" process parameters into one file of the real time DBMS for, for example, day/week, and use another file for "slow" summary data logging about workshop production for one year. Such logs subdivision into "fast" and "slow" would save much system resources, as compared against the "one parameter – one table – one file" method, which is frequently used in other SCADA/HMI. In combination with high speed data saving, which is 10-100 times higher than the speed of "heavy" relational DBMS, the SIAD/SQL 6 provides maximum efficiency and reliability of process history recording. The SIAD/SQL 6 real time DBMS is optimized for fast saving and reading of intensive data flows in 24x7 mode. It can save over one billion parameters with time labels accuracy of up to 1 ms. In order to provide reliability of data storage the SIAD/SQL 6 real time DBMS, provides hot redundancy (dual or triple) for servers, and the automatic data recovery system for corrupted archives. According to the extreme testing results carried out on Pentium-IV, 3 GHz PC PC with 1 GB RAM, the real time DBMS server operating under the SIAD/SQL 6 has shown an error-free recording of over 1.000.000 changes of analogue parameters per second. Such speed is 10-100 times higher that the speed of the most competing products (the SIAD/SQL 6 real time DBMS speed tests were performed on the PC with 2 hard disks with Serial ATA interface, integrated into RAID-0 (Stripe) array). The SIAD/SQL 6 real time DBMS server performs dynamic optimization of the information recorded, which reduces archive volume up to 10 times. Global Logger performs statistical processing of the stored information in real time for statistical process control (SPC). The results will be displayed on the HMI screens. Micro TRACE MODE 6 is powerful multiplatform runtime designed for use in open PLC for direct digital process control. 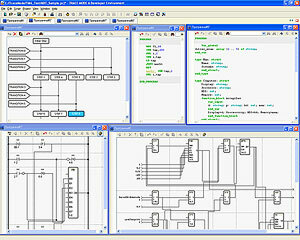 The project for Micro TRACE MODE is programmed in the Integrated Development Environment. For Micro RTM programming, the system offers 5 languages of the international standard IEC 6-1131/3. The powerful debugging features are also available. remotely started up, stopped, and edited online – without shutdown of the controller. NetLink Light 6 graphic console is a TRACE MODE® HMI client runtime. The NetLink Light is designed for use on additional workstations, connected to the TRACE MODE 6 servers. supervisory control via the TRACE MODE servers. The NetLink Light 6 based HMI is represented in the TRACE MODE 6 project as a separate node having its own network TCP/IP address. The NetLink Light node does not contain its own I/O channels, but only the calls of HMI screens and programs. The HMI screens can be copied from any node of the project, or designed specially for the console. One NetLink Light 6 can connect simultaneously to many TRACE MODE 6 servers, therefore the NetLink Light 6 HMI screens can display the information received from different TRACE MODE RTMs, RTM+ and Micro RTMs. It is possible to connect the unlimited number of NetLink Light 6 HMI clients to a single TRACE MODE server. 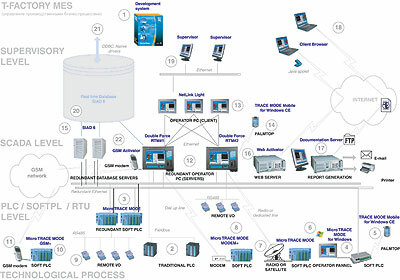 The first four interfaces are supported by conventional TRACE MODE SCADA/HMI servers – Real Time Monitors. For GSM based remote control the TRACE MODE GSM-RTM+ should be used. In a normal mode, RTM+ performs cyclic polling of RTU units operating under control of Micro TRACE MODE Modem +, gather the accumulated data from RTU local archives, processes them and adds to SIAD/SQL, classifying by the time registered by RTU. SCADA/HMI-server also analyses alarms and in case of emergency can shift to emergency mode with capture of remote terminal unit. In order to provide reliable communication with remote controllers (RTU) TRACE MODE has built-in special antinoise remote control protocol M-LINK CRC. The Micro TRACE MODE GSM+ и GSM-RTM+ based remote control systems provide protection against unauthorized access. These programs offer the access control by the SIM card number, and also the control of the valid operations. TRACE MODE GSM-RTM+ remote control systems are fully integrated into the TRACE MODE and T-Factory security system. Together with process control , a manufacturing automation system may be build in the integrated development system. The MES, EAM and HRM applications are run under T-FACTORY.exe® runtimes. account for the labor cost. The T-FACTORY RTM normally uses the real time DBMS SIAD/SQL 6 for data storage. User reports containing statistics for MES, EAM and HRM can be generated using TRACE MODE documentation server. T-Factory NetLink Light 6 is a graphic console runtime for MES/EAM/HRM applications. It performs visualisation of data received from the T-FACTORY and TRACE MODE servers. The T-Factory NetLink Light is suitable for use on additional MES, EAM, HRM workstations, connected to the servers. The graphic features of T-Factory NetLink Light are equal to those of the server. One client can connect simultaneously to many TRACE MODE 6 servers. The T-FACTORY 6 NetLink Light has a lower price than the server and can be used for optimisation of cost in the MES, EAM and HRM applications.